We already described ways of obligatory registration of a physical or a legal person entrepreneur as a VAT payer in our blog post. Here we will introduce one more way to register as a VAT payer, specifically as an identified person (Czech editor’s note ‘identifikovana osoba’, hereinafter only identified person). An identified person is a VAT payer only in relation to transactions made outside the Republic. In the Czech Republic, such a person does not pay VAT and does not have a right to reimburse a VAT from the incoming purchases. When should you register as an identified person? – provision of a service in another EU state (except for services that are VAT free in the EU). When is it necessary to register? You can register as an identified person on a voluntary basis if you know that such registration will soon be necessary. What responsibilities are connected with the registration? 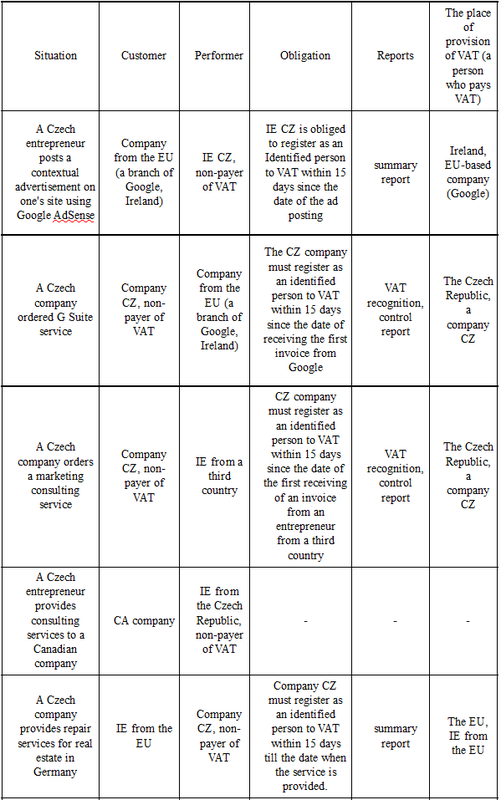 If you provided a service for another EU member state, you are to file a summary report for the EU (souhrnné hlášení» – a kind of a tax declaration which is used to inform the Tax institution about taxable transactions performed by entrepreneurs who reside in the EU) till the 25th day following the reporting month. There is no need in filing a VAT recognition and in paying it since you do not have the tax obligation. if the VAT was transferred to you (for instance, you purchased a service in another EU member state and it was provided in the Republic), then you are to submit a recognition of VAT till the 25th day following the reporting months (ed. from the Czech language «přiznaní DPH»), the control report («kontrolní hlášení» – a detailed report that contains every movement of a product/service, a kind of a tax declaration which is used as an instrument to control tax evasion), and to pay VAT to the Czech Republic. You provided contextual advertising services through Google AdSense and received income in the form of a click after a visitor opened the link posted on your website. You become an identified person from the date of posting the mentioned service on your site. By placing a contextual advertisement on your webpage, you provided a service to another EU member state (in this case, Google in Ireland). Thus, until the 25th day following the reporting month, you will file a summary report without paying VAT and transfer this obligation to Google. You ordered a service to place your ads on Facebook. In this case, the invoice for the provided service will be issued to you with the Irish VAT number and consequently, the VAT will be transferred to the recipient of the service. You should register as an identified person within 15 days after receiving such an invoice. Till the 25th day following the reporting month, you will file a VAT recognition (in which you will calculate VAT) and a control report. VAT must be paid together with filing reports. We will describe these and other examples more detailed in the summary table. Unlike the classic VAT payer, an identified person has a limited range of responsibilities. For the Czech Republic an identified person is not a VAT payer and does not have a right to add 21% VAT, and also return VAT from the taxable operations in the Czech Republic. A classic VAT payer files reports on VAT every reporting period, regardless of the fact whether there is a tax obligation. An identified person does not need to file VAT reports (VAT recognition, control and summary report) if there is no tax obligation in the reporting period. 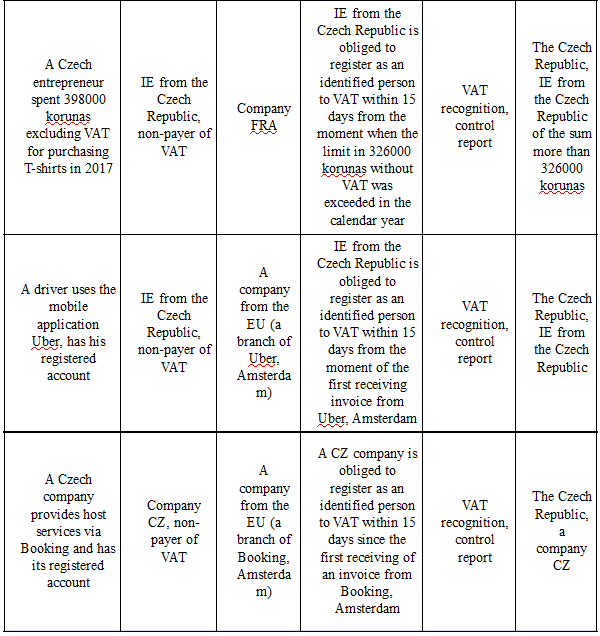 So, let’s make the summary for identified persons according to the mentioned above: if you provided a service in the EU – you file a summary report only; if you received a service from abroad – you file a VAT recognition; if you received a service from abroad and provided it in the EU – it is necessary to file all the three reports (VAT recognition, control report, summary report); if there were no taxable operations with VAT – reports are not filed. If you still have questions regarding registration to VAT, do not hesitate to contact us!